The replicative helicase in eukaryotic cells is comprised of minichromosome maintenance (Mcm) proteins 2 through 7 (Mcm2-7) and is a key target for regulation of cell proliferation. In addition, it is regulated in response to replicative stress. One of the protein kinases that targets Mcm2-7 is the Dbf4-dependent kinase Cdc7 (DDK). In a previous study, we showed that alanine mutations of the DDK phosphorylation sites at S164 and S170 in Saccharomyces cerevisiae Mcm2 result in sensitivity to caffeine and methyl methanesulfonate (MMS) leading us to suggest that DDK phosphorylation of Mcm2 is required in response to replicative stress. We show here that a strain with the mcm2 allele lacking DDK phosphorylation sites (mcm2AA) is also sensitive to the ribonucleotide reductase inhibitor, hydroxyurea (HU) and to the base analogue 5-fluorouracil (5-FU) but not the radiomimetic drug, phleomycin. We screened the budding yeast non-essential deletion collection for synthetic lethal interactions with mcm2AA and isolated deletions that include genes involved in the control of genome integrity and oxidative stress. In addition, the spontaneous mutation rate, as measured by mutations in CAN1, was increased in the mcm2AA strain compared to wild type, whereas with a phosphomimetic allele (mcm2EE) the mutation rate was decreased. These results led to the idea that the mcm2AA strain is unable to respond properly to DNA damage. We examined this by screening the deletion collection for suppressors of the caffeine sensitivity of mcm2AA. Deletions that decrease spontaneous DNA damage, increase homologous recombination or slow replication forks were isolated. Many of the suppressors of caffeine sensitivity suppressed other phenotypes of mcm2AA including sensitivity to genotoxic drugs, the increased frequency of cells with RPA foci and the increased mutation rate. Together these observations point to a role for DDK-mediated phosphorylation of Mcm2 in the response to replicative stress, including some forms of DNA damage. We suggest that phosphorylation of Mcm2 modulates Mcm2-7 activity resulting in the stabilization of replication forks in response to replicative stress. DNA replication is tightly regulated to ensure that genomes are copied once and only once per cell division cycle . In addition, cells must respond to assaults that damage DNA and/or disrupt replication forks by preventing the initiation of DNA replication and stabilizing active replication forks . One of the targets for these regulatory events is the replicative helicase that unwinds DNA at the replication fork [3–8]. The catalytic core of the replicative helicase in eukaryotic cells is a heterohexameric complex comprised of the minichromosome maintenance proteins 2 through 7 (Mcm2-7; [9, 10]). Mcm2-7 activity is tightly controlled during the initiation of DNA replication and is targeted in response to replicative stress [3, 6–8, 11–14]. In vivo, Mcm2-7 functions within the CMG complex comprised of Cdc45, Mcm2-7 and the tetrameric GINS complex (Sld5, Psf1, Psf2 and Psf3) [11, 12]. The catalytic activity for DNA unwinding resides in Mcm2-7 with Cdc45 and GINS playing roles in limiting Mcm2-7 activity to S phase and providing scaffolding functions within the replisome [11, 15–17]. CMG is isolated from replicating yeast cells as part of the RPC (replisome progression complex) that includes the checkpoint protein Mrc1, the fork pausing complex Tof1-Csm3, the histone chaperone FACT and the sister chromatid cohesion factor, Ctf4 . Mcm2-7 activity is also regulated by phosphorylation. 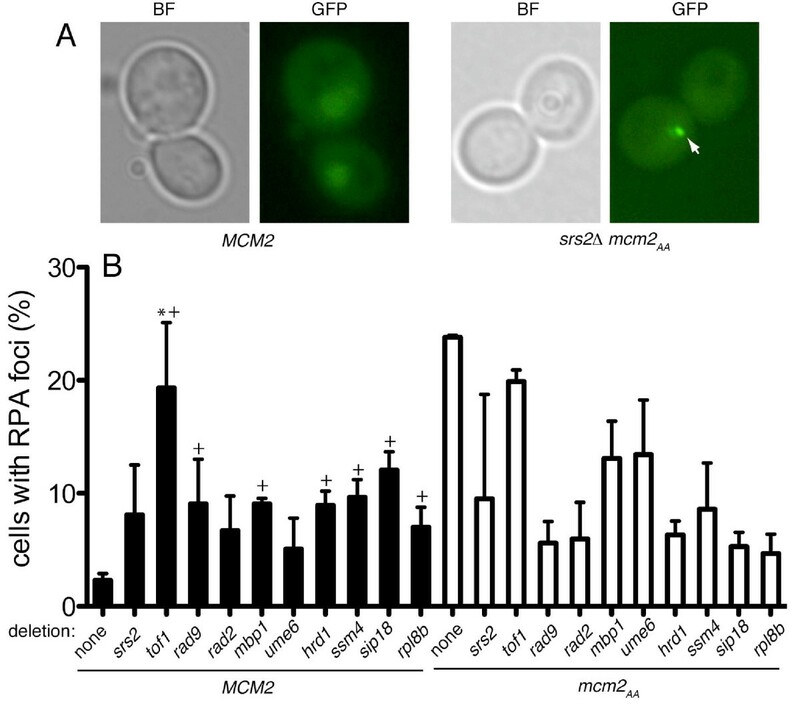 A recent study from our laboratory showed that phosphorylation of Saccharomyces cerevisiae Mcm2 by the Dbf4-dependent kinase, Cdc7 (DDK) at S164 and S170 is important for a proper response to DNA damage . Strains containing a non-phosphorylatable allele of mcm2 (mcm2AA) grow similarly to wild type cells in normal growth conditions but are sensitive to the DNA alkylating agent, methyl methanesulfonate (MMS) and to caffeine. Caffeine is a purine analogue with pleiotropic effects. In general, caffeine inhibits PI3K-related kinases, which in yeast include TOR (Tor1 and Tor2), Mec1 and Tel1 [18–21]. TOR controls cell growth in response to nutrients and stress whereas Mec1 and Tel1 are both checkpoint kinases that also have roles in control of replication initiation (Mec1) and telomere maintenance (Tel1) [3, 22–24]. Here, we show that in addition to MMS and caffeine, the mcm2AA strain is sensitive to the ribonucleotide reductase inhibitor, hydroxyurea (HU) and the base analogue 5-fluorouracil (5-FU), but not phleomycin, a radiomimetic drug. The phosphomimetic glutamic acid substitutions at S164 and S170 suppress sensitivity to these drugs. We examined the genetic network within which mcm2AA functions and found 9 deletions that have synthetic slow growth or lethal interactions with mcm2AA and 16 deletions that suppress the caffeine sensitivity of mcm2AA. The identities of these gene deletions are consistent with a role for Mcm2 phosphorylation in the response to DNA damage and replicative stress and include two members of the RPC. A role in response to replicative stress is emphasized by the higher than wild type spontaneous mutation rate in the mcm2AA strain and a lower than wild type mutation rate with the mcm2EE phosphomimetic allele. Most of the gene deletions that suppressed the caffeine sensitivity of mcm2AA also relieved other phenotypes of mcm2AA. We propose that phosphorylation of Mcm2 by DDK is required in response to replicative stress to stabilize Mcm2-7 at replication forks. We examined the growth of the mcm2AA strain on media containing agents that cause replicative stress (Figure 1A & B). 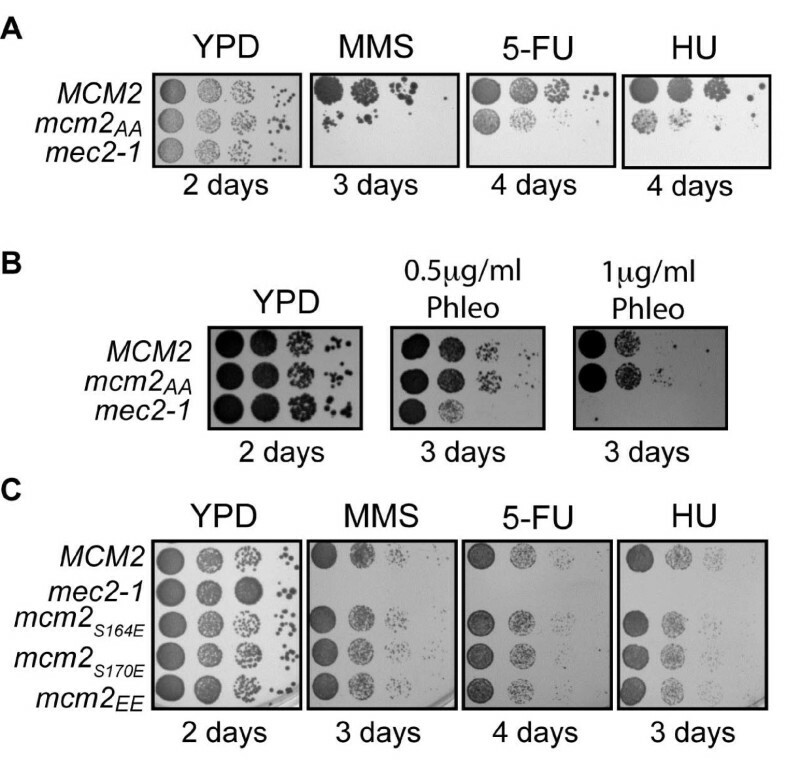 The mcm2AA strain had reduced growth relative to MCM2 on YPD plates containing MMS or 5-FU (Figure 1A), but not on plates containing phleomycin (Figure 1B). These agents have different effects on DNA stability in budding yeast. MMS damages DNA by methylating guanines and adenines . The effects of 5-fluorouracil in yeast are two-fold: it inhibits the pyrimidine biosynthesis pathway and results in misincorporation of uracil into nascent DNA . Phleomycin is structurally similar to bleomycin, a radiomimetic drug that causes double stranded DNA breaks . The mcm2AA strain also grows poorly upon constant exposure to the ribonucleotide reductase inhibitor, hydroxyurea (HU), which interferes with the integrity of DNA replication forks and induces an S phase checkpoint [28, 29]. Sensitivities of mcm2 alleles to genotoxic agents. The growth of phosphorylation site mutations in mcm2 was compared on plates containing genotoxic agents. The mec2-1 strain  was utilized to control for plate quality. A) The growth of mcm2AA and MCM2 strains was compared on YPD and YPD containing 0.03% MMS, 400 μM 5-FU or 200 mM HU by spotting 10-fold serial dilutions of the strains followed by growth at 30°C for the indicated times. B) Similarly, the growth of mcm2AA and MCM2 strains was compared on YPD with and without phleomycin. C) The growth of mcm2EEmcm2S164Emcm2S170E and MCM2 on YPD with 0.03% MMS, 400 μM 5-FU or 200 mM HU. We noted previously that Mcm2 in which S164 and S170 are altered to glutamic acids (mcm2EE) acts like a phosphomimic, allowing growth of cells in the presence of caffeine and MMS, and has the same activity in vitro as phospho-Mcm2 . If phosphorylation of Mcm2 is required in response to 5-FU and HU, then mcm2EE should be insensitive to these agents. As predicted, the mcm2EE strain grew similarly to wild type cells in the presence of 5-FU and HU (Figure 1C). Substitution of Glu for S at position 164 or 170 also resulted in wild type growth consistent with the requirement to mutate both Ser to Ala to obtain a phenotype . The sensitivity of the mcm2AA strain to caffeine, MMS, 5-FU and HU suggests that phosphorylation of Mcm2 is required in response to replicative stress. Furthermore, the increased frequency of RPA foci in these cells  suggests disruption of replication forks or an inability to respond to replicative stress [30–32]. If our model is correct, then mutations that increase genomic instability will be synthetic lethal or show slow growth with mcm2AA. After screening the S. cerevisiae non-essential deletion collection for synthetic lethal interactions with mcm2AA and confirming the interactions by tetrad dissection, we found 8 gene deletions that result in no or slow growth when combined with mcm2AA (Table 1 and Additional file 1). Three of the eight gene deletions that display synthetic lethal or slow growth interactions with mcm2AA affect cell stress responses or cell cycle. In particular, the synthetic interaction of mcm2AA with chk1Δ, a deletion in the gene encoding a checkpoint effector kinase is consistent with the idea that mcm2AA is important in response to replicative stress. In addition, ctf4Δ sod1Δ and img1Δ all lead to genomic instability or increase DNA damage [33–36] and their negative synthetic interactions with mcm2AA support the idea that Mcm2 phosphorylation is important in response to DNA damage. Genes are grouped by their GO terms as annotated in the Saccharomyces cerevisiae database . Gene ontology: (1) Response to cell stress/chemical stimuli (2) cell cycle, (3) transport, (4) RNA metabolic process, (5) signalling process/protein modification process, (6) transcription, (7) carbohydrate metabolic process, (8) cell wall, membrane, & vesicle mediated transport, (9) mitochondrial organization, and (10) other. One potential role of Mcm2 phosphorylation in response to replicative stress is in the induction of a checkpoint signal leading to phosphorylation of Rad53, detected by decreased migration through SDS-PAGE. We examined Rad53 by Western blotting in the MCM2 and mcm2AA strains before and after treatment with 0.02% MMS, which triggers the S phase checkpoint. As seen in Figure 2, the migration of Rad53 is slower in the presence of MMS in both strains, suggesting that signalling in response to DNA damage is intact and that phosphorylation of Mcm2 is not required to activate checkpoint. We also tested for a genetic interaction between mcm2AA and a checkpoint deficient allele of RAD53 (mec2-1). After mating the strains and generating spore progeny by tetrad dissection, none of the spore colonies contained both mutations indicating a synthetic lethal interaction, consistent with Mcm2 phosphorylation functioning in a parallel pathway to Rad53 ( Additional file 1). Rad53 activation in the mcm2 AA strain. Western blots of crude protein lysates of mcm2AA or MCM2 strains probed with anti-Rad53 antibody before and after treatment with MMS. Log phase cultures in YPD were grown for 2 hours at 30°C in the presence or absence of 0.02% MMS. After harvesting by centrifugation, protein was extracted with TCA, as described . Approximately 20 μg of total protein was examined by Western blotting using anti-Rad53 antibody (Santa Cruz Biotechnology, SC-6749) as primary antibody followed by rabbit anti-goat IgG coupled to horseradish peroxidase (Sigma-Aldrich). The blots were visualised using the Supersignal West Pico chemiluminescence kit (Pierce) and x-ray film. If phosphorylation of Mcm2 is important in response to DNA damage and/or replicative stress, cells containing the non-phosphorylatable allele of mcm2 (mcm2AA) would be predicted to accumulate mutations at a higher rate than cells with MCM2 or mcm2EE. To test this, we utilized the CAN1 forward mutation assay in which a mutation rate is determined from the number of canavanine resistant colonies that arise. CAN1 encodes a transporter that enables the toxic compound canavanine to enter cells. If CAN1 function is lost, then the cell is rendered resistant to canavanine. We grew CAN1 strains containing different alleles of mcm2 for several generations in liquid media without selection before determining the number of canavanine resistant colonies and the mutation rate using the method of the median [39, 40]. The mutation rate was nearly two-fold higher in the mcm2AA strain than with MCM2 (5.5 x 10-7 v. 3.2 x 10-7), consistent with an inability to respond properly to spontaneous DNA damage in the absence of Mcm2 phosphorylation. Significantly, the mutation rate in the mcm2EE strain was half that of the MCM2 strain (1.6 x 10-7). As mcm2AA is predicted to interfere in the response to replicative stress, second site mutations that decrease DNA damage or increase the capacity for DNA repair would be expected to act as suppressors. We therefore screened the haploid deletion strain collection for gene deletions that suppress the caffeine sensitivity of mcm2AA. Sensitivity to caffeine was chosen because of the strong phenotype it elicits with mcm2AA. Candidates were re-mated, isolated by tetrad dissection and re-tested on YPD with caffeine. Sixteen gene deletions were identified (Figure 3). We classified these genes by biological functions based on gene ontology annotations in the Saccharomyces Genome Database  as well as their reported functions in the literature (Table 2). These classifications yielded four groups of genes: cell stress, cell cycle, protein folding and “other” functions. Interestingly, half of the deletions, when independent of mcm2AA, were sensitive to caffeine indicating roles for these genes in response to caffeine. Four of these, tof1Δ mbp1Δ ume6Δ and sip18Δ were as sensitive to caffeine as mcm2AA. Others, such as rad9Δ, rad2Δ, pdr15Δ and hrd1Δ, displayed an intermediate sensitivity. In addition, three showed decreased sensitivity to caffeine compared to wild type MCM2 (yhp1Δ, ssm4Δ and rpl8bΔ). We also note that some of the deletions, such as tof1Δ, rad9Δ and pac10Δ, resulted in only partial suppression (Figure 3). Identification of gene deletions that suppress mcm2AA. The growth of strains with deletions that suppress the caffeine sensitivity of mcm2AA was compared on YPD and YPD with 15 mM caffeine. Approximately 5000 cells/ml and 10-fold serial dilutions were spotted and grown at 30°C. Genes are grouped by their GO terms as annotated in the Saccharomyces cerevisiae database . Horizontal lines separate different classes. Gene ontology: (1) Response to cell stress/chemical stimuli (2) cell cycle, (3) transport, (4) RNA metabolic process, (5) signalling process/protein modification process, (6) transcription, (7) carbohydrate metabolic process, (8) ER-mediated degradation & protein-folding and (9) other. Our hypothesis predicts that deletions that suppress the caffeine sensitivity of mcm2AA will also decrease the mutation rate in the mcm2AA strain. Therefore, we repeated the CAN1 forward mutation assay on a subset of the deletion strains. As shown in Figure 4, seven of the 11 deletions tested decreased the mutation rate, both with the deletion alone and in the presence of mcm2AA. The exceptions were tof1Δ rad2Δ and ume6Δ. Deletion of tof1 causes genomic instability [41–43] and rad2Δ is deficient in nucleotide excision repair . Ume6 is involved in the expression of several genes and deletion of ume6 increases homologous recombination [45–48]. Mutation rates of mcm2 alleles and strains with gene deletions that suppress mcm2AA. The mutation rates of MCM2 and mcm2AA strains with and without gene deletions that suppress mcm2AA were calculated as described [39, 40] using the CAN1 forward mutation assay. Dark grey bars are the deletions in the MCM2 background; white bars are with mcm2AA and the light grey bar (far left) is the mcm2EE strain. The error bars represent the upper and lower confidence limits (95%) of the mutation rates and were calculated from the 95% confidence limits of the median determined from the binomial distribution . To further evaluate the mechanisms by which the gene deletions suppress mcm2AA, we spotted strains containing the suppressor deletions and either MCM2 or mcm2AA onto YPD plates containing MMS, 5-FU and HU (Figure 5, Table 3 and Additional file 1). All of the deletions that suppressed the caffeine sensitivity of mcm2AA also suppressed at least one other drug sensitivity of mcm2AA, exemplified by rad2Δ and ssm4Δ (Figure 5). Many of the deletions in the cell stress group also lead to sensitivity to these drugs in the MCM2 background, thus likely accounting for the complex phenotypic patterns. For example, the srs2 and rad9 deletions do not suppress the sensitivity of mcm2AA to MMS or 5-FU and only partially suppress on HU (Figure 5). Some of the deletions decrease sensitivity to the drugs in an otherwise wild type background. For example, the yhp1Δ strain grows faster than the wild type strain on plates containing MMS or 5-FU (Figure 5). This increased growth is also noted in the mcm2AAyhp1Δ strain. Therefore, the yhp1 deletion likely functions non-specifically to suppress mcm2AA. Of note, Yhp1 is a transcriptional repressor that along with Yox1 is involved in the cyclic transcription of a set of genes that includes MCM2-7. However, deletion of yhp1 alone did not affect expression of MCM3-lacZ and had little or no effect on cell growth . The ett1Δ deletion on MMS or HU and sip18Δ on HU similarly increase growth of cells containing the wild type and mutated mcm2 alleles (Table 3 and Additional file 1). 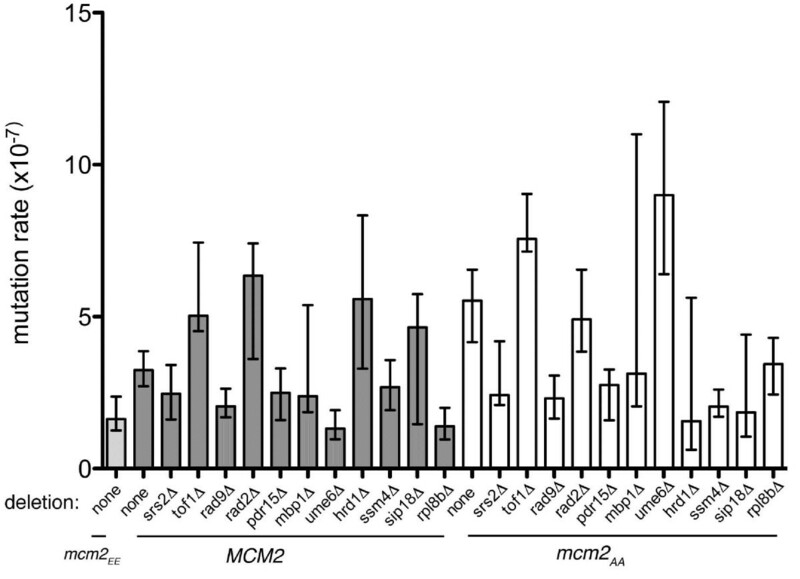 Sensitivity of strains containing gene deletions that suppress mcm2 AA to MMS, 5-FU and HU. 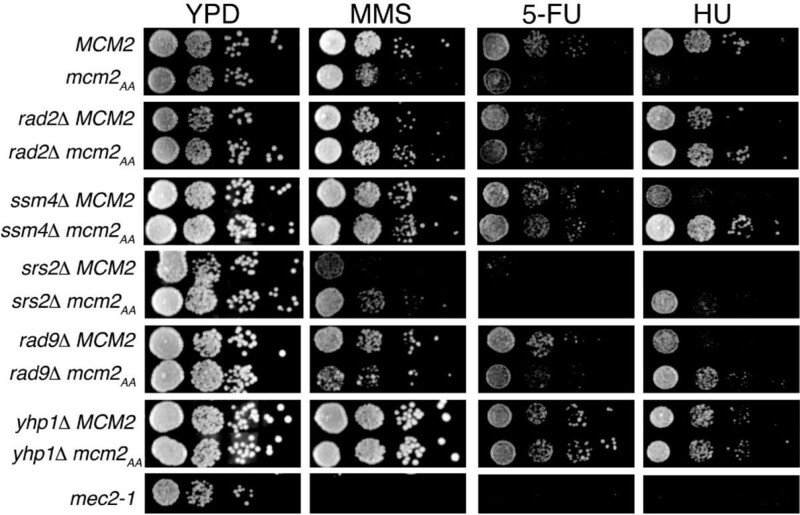 The growth of strains containing deletions that suppress the caffeine sensitivity of mcm2AA was examined on YPD with and without 0.03% MMS, 400 μM 5-FU or 200 mM HU. Ten-fold serial dilutions of the strains were spotted on each of the plates and grown for the indicated times. Shown here are selected strains. The results with all of the suppressors are shown in Additional file 1. The sensitivities of the deletion strains (with wild type MCM2) to each drug is indicated by “R” for growth similar to wild type, “S” for growth slower than wild type or “R+” for better than wild type growth. For suppression of the phenotypes associated with mcm2AA, “-“indicates no suppression, “+” indicates suppression, “E” indicates epistasis and “ND” indicates that the test was not performed on that strain. Previously, we observed that the mcm2AA strain has a higher frequency of cells with RPA foci . RPA is the single-stranded DNA binding protein and thus foci represent generation of single stranded DNA. In wild type cells, RPA is diffuse in the nucleus (Figure 6A). In a low percentage of wild type cells, RPA foci will appear. Since a higher frequency of cells contain foci when treated with DNA damaging agents, the foci are thought to represent ongoing repair processes or disruption of the replication fork, both of which generate stretches of single stranded DNA [30–32]. Interestingly, in cells containing mcm2AA, RPA foci appear in a much higher frequency of cells; ~20 percent (Figure 6A and B; ). As a means of determining the mechanisms by which the gene deletions suppress mcm2AA, we tested whether they also suppress the increased frequency of cells with RPA foci. We transformed a plasmid encoding GFP-tagged Rpa1 into a subset of the suppressor strains and scored each for cells with RPA foci (Figure 6B). In isolation, the gene deletions had a higher ratio of cells with RPA foci than wild type (Figure 6B) with the tof1, rad9, mbp1, hrd1 ssm4 sip18 and rpl8b deletions having p values less than 0.05, reflecting the effect of these deletions on genomic stability. Despite this increase, deletion of most of the genes tested suppressed the increased frequency of RPA foci in the mcm2AA strain; srs2Δ did not (p ≥ 0.05). Deletion of tof1 also did not suppress mcm2AA. Indeed, tof1Δ in the wild type background greatly increases the frequency of cells with RPA foci. This increased frequency might be explained by the observation that disruption of the tof1 ortholog in S. pombe (swi1) decouples polymerases, generating excess single stranded DNA [50–52]. RPA foci in the suppressor strains. Cells with RPA foci were identified using GFP fused to Rpa1 as described . A) An example of RPA foci is shown. Bright field (BF) and fluorescent (GFP) images are shown for MCM2 (left panels) and srs2Δ mcm2AA (right panels). A RPA focus in the srs2Δ mcm2AA image is indicated by the white arrow. B) The percentage of cells containing RFA foci was measured in triplicate experiments and standard deviation was determined. The asterisks indicate strains that do not have statistically significant different frequency of RPA foci compared to mcm2AA (p ≥ 0.05, Student’s unpaired t-test) while the crosses indicate strains that are statistically different from wild type (p < 0.05). Our findings suggest a role for phosphorylation of Mcm2 by DDK in response to replicative stress. Specifically, we demonstrate that the mcm2AA strain is sensitive to drugs that cause replicative stress, has an increased mutation rate and that mcm2AA interacts with genes involved in the response to replicative stress. Along with our previous study showing that phosphorylation of Mcm2 at S164 and S170 slows DNA unwinding and results in enhanced DNA binding by Mcm2-7 in vitro, our results lead to a model in which phosphorylation of Mcm2 slows DNA unwinding by Mcm2-7 and/or stabilizes the replication fork as part of the proper response to replicative stress. When a replication fork encounters DNA damage such as a base lesion or a break in the DNA strand, synthesis by the replicative polymerases at that fork halts. A series of events must then occur for replication to proceed . While double stranded DNA breaks, base damage or nucleotide depletion each induce the S phase checkpoint, which inhibits further initiation of DNA replication and stabilizes replication forks, the form of the response differs depending on the type of perturbation [54, 55]. Given the sensitivity of the mcm2AA strain to MMS and 5-FU, we propose that phosphorylation of Mcm2 by DDK is required to stabilize replication forks in response to DNA base damage. The lack of sensitivity to phleomycin with this strain suggests that Mcm2 phosphorylation may not be required in response to double strand breaks. That DDK phosphorylation would trigger Mcm2 participation in the response to replicative stress is not surprising given DDK participates in responses to DNA damage and replicative stress and is a target of Rad53 during the S phase checkpoint [56–60]. The genetic interactions with mcm2AA are most consistent with a requirement for Mcm2 phosphorylation in response to disruption of the replication fork. The effect of the suppressing deletions can be explained as either decreasing spontaneous DNA damage, which would otherwise disrupt replication forks or increasing the capacity for rescue of disrupted forks by recombination. In contrast, the deletions that result in synthetic lethal interactions increase spontaneous DNA damage, perturb the replication fork and/or are required for checkpoint responses. 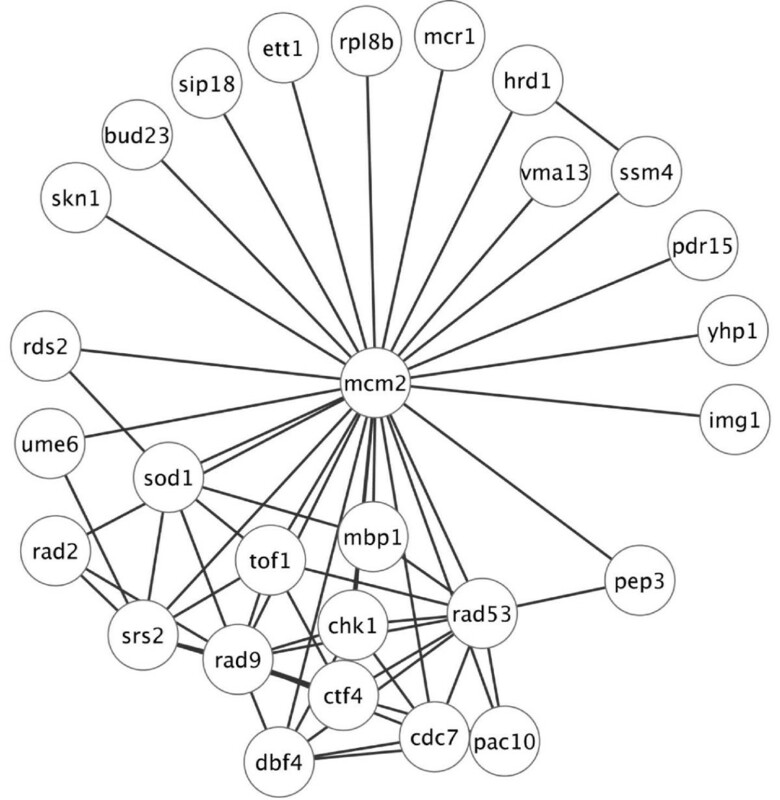 Mapping the interactions within the 25 genes connected to mcm2AA indicates that about 15 form a network independently of mcm2 (Figure 7). Most of the interacting genes have roles in response to DNA damage and replicative stress. Interestingly, several of the genes interact with CDC7 and DBF4, the genes encoding the two components of DDK (Figure 7). Interactions amongst mcm2 AA interactors. A map of interactions amongst the genes connected with mcm2AA was generated using Cytoscape 2.8.2 [61, 62]. Physical and genetic interactions annotated on SGD  were used to generate the map. Also included are interactions within this group with CDC7 and DBF4, the genes encoding the components of DDK. Of the 25 genetic interactions with mcm2 that we isolated, only one was previously identified. Deletion of rad9 has a synthetic lethal interaction with mcm2-1, a temperature sensitive allele . Interestingly, here rad9Δ suppresses some, but not all, of the phenotypes associated with mcm2AA. The difference may result from allele specificity; mcm2-1 is expected to affect Mcm2’s essential role in Mcm2-7 function whereas the mcm2AA allele affects Mcm2 activity in response to replicative stress. Deletion of three genes, HRD1, SSM4 and PAC10 whose products are involved in targeting misfolded proteins for degradation [64, 65], suppress mcm2AA. One possible mechanism for these suppressors is that misfolded proteins induce the unfolded protein response (UPR) which in turn provides protection against reactive oxygen species which can damage DNA . However, the mechanism of suppression is more complex since mcm2AA is still sensitive to caffeine or MMS in the presence of tunicamycin, which induces the UPR (data not shown). We propose that phosphorylation of Mcm2 by DDK is required in response to replicative stress. This role is not recognition of damage or replication fork collapse since the S phase checkpoint is intact at least up to Rad53 phosphorylation. Furthermore, mcm2AA has synthetic lethal interactions with chk1Δ and mec2-1, mutations in the genes encoding the checkpoint effector kinases in yeast [2, 67–69]. Synthetic lethal interactions often indicate function of the interacting genes in parallel pathways. Based on the previously observed biochemical activities of Mcm2-7 with DDK-phosphorylated or phosphomimetic Mcm2 , we surmise that phosphorylation of Mcm2 may stabilize Mcm2-7 on DNA and/or slow the helicase. DNA helicases are predicted to contact DNA through the sugar phosphate backbone, not the bases . Therefore, unlike replicative polymerases that stall at sites with missing or damaged bases, the helicase will continue unwinding DNA and may decouple from the polymerase. Indeed single stranded DNA generated by decoupling of helicase from the replicative polymerases is proposed to generate a checkpoint response [71–77]. Decoupling appears to be regulated so that the helicase does not advance too far from the rest of the replisome, leading to complete disassembly of replication forks . One role for Mcm2 phosphorylation may be to slow the helicase so that it does not proceed too far ahead of the replicative polymerases. In this model, the accumulation of RPA foci in the mcm2AA strain is not due to spontaneous decoupling of the helicase from polymerase but rather is due to DNA damage triggering decoupling of the helicase. The idea that replicative stress triggers a requirement for Mcm2 phosphorylation by DDK is supported by the synthetic lethal interaction of mcm2AA with deletions that lead to genomic instability. Examples include ctf4Δ and img1Δ. Ctf4 is involved in sister chromatid cohesion and is integral to the RPC [16, 36, 79–81]. Deletion of img1 leads to loss of functional mitochondria which in turn leads to genomic instability [34, 35]. Increased DNA damage is also noted in strains with increased levels of ROS, such as sod1Δ and vma13Δ[82, 83], both of which are synthetically lethal with mcm2AA. Rad9 is important for transmission of checkpoint signalling with deletion of rad9 resulting in cells that fail to arrest in response to DNA damage [84, 85]. The increased homologous recombination noted with srs2Δ rad2Δ and ume6Δ may suppress mcm2AA by providing a means to resolve stalled replication forks [45, 86–88]. Finally, the model that Mcm2 phosphorylation may be required to slow replication forks is supported by the ability of tof1Δ to suppress defects of mcm2AA only in the presence of genotoxic agents (tof1Δ does not suppress the increased mutation rate or increased frequency of RPA foci). Lack of Tof1, a member of the RPC, slows replication forks , however this occurs only in the presence of replicative stress, such as seen in the presence of genotoxic agents . Phosphorylation of Mcm2 by DDK is required for the proper response to replicative stress, but not to induce a checkpoint. This phosphorylation event likely slows the Mcm2-7 helicase and/or stabilizes replication forks. In the absence of Mcm2 phosphorylation, the mutation rate is increased. Caffeine, HU and MMS were purchased from Sigma Aldrich (99% purity); geneticin (G418) from either United States Biological or Santa Cruz Biotechnology; phleomycin from Santa Cruz Biotechnology; 5-FU from Nutritional Biochemicals Corp. YPD is 1% yeast extract, 2% peptone and 2% D-glucose. The yeast strains MDY167 (MCM2-URA3), MDY169 (mcm2AA-URA3) and MDY191 (mcm2EE-URA3) are described in Stead et al. and the mec2-1 strain in . The genetic screens were a modification of SGA analysis . Manipulation of the gene arrays was performed manually using a 3.18-mm 48-pinner tool (V&P Scientific, San Diego, CA). Screens were performed using MDY169 (MAT α mcm2AAURA3) or MDY167 (MAT α MCM2-URA3) mated with the haploid yeast Magic Marker deletion collection generated from the diploid strain collection (Open Biosystems; ). Diploids were selected and then sporulated before selecting haploid cells that contained a gene deletion (KanR) and mcm2AA or MCM2 (Ura+). Plates were scanned on a HP Scanjet 3970 and colony size was compared using ImageQuant TL (GE Healthcare). A synthetic lethal or slow growth (SSL) phenotype was assigned if the colony size was smaller in the mcm2AA cross than in the MCM2 cross. A false positive rate (growth when the gene deletion is reported as lethal in SGD ) was roughly 5% and is similar to false positive rates reported previously . From this initial screen, we compiled a list of 234 genes that had SSL interactions with mcm2AA. Next, the candidates were retested from the mating step in triplicate. Forty-one SSL interactions were identified in this step. The deletions were then re-tested for genetic interactions with mcm2AA by re-mating followed by tetrad dissection. SSL interactions were verified if Ura + and G418R spore progeny were never recovered or grew slowly relative to the corresponding single mutations. A screen to isolate deletions that suppress the caffeine sensitivity of mcm2AA was performed by pinning the haploid mcm2AA strains that also contained a gene deletion (generated as described above) to YPD containing 15 mM caffeine. The plates were incubated at 30°C for 4 days, imaged and then quantified. A spot was determined to contain a deletion that suppresses mcm2AA when its size was larger than the spot size of the mcm2AA strain. The deletion of 369 genes suppressed the growth defect of mcm2AA in caffeine in the initial screen. These candidate deletions were re-mated in triplicate, haploids generated and retested for sensitivity to caffeine, resulting in 86 strains containing a deletion that potentially suppresses mcm2AA. The 86 were strains re-mated, sporulated and tetrads dissected. A G418 resistant, Ura + colony was identified, grown to saturation and 10-fold serial dilutions were spotted onto YPD with and without 15 mM caffeine. The forward mutation assay was performed as described in . Briefly, at least 20 colonies were inoculated into 10 x 1 ml YPD and the cultures grown overnight at 30°C to 1–2 x 108 cells/ml. Each culture was diluted to approximately 200 cells/1 ml YPD and grown to 1–2 x 108 cells/ml. Cells were then plated (~ 107) on CM-Arg plates containing 25 μg canavanine/ml and appropriate dilutions were made before plating on YPD. Colonies on each plate were counted to determine the number of canavanine resistant cells per 107 cells. The mutation rate was calculated using the method of the median [39, 40]. This work was supported by a Canadian Institutes of Health Research Operating Grant (MOP 68926) to MJD and by funding from Schulich School of Medicine & Dentistry. BES was supported by a Natural Science and Engineering Research Council PGS-D fellowship. BES carried out the screens and drug assays with assistance from CJB and MKS and wrote a draft of the manuscript. MJD did the microscopy, mutation assays, Rad53 blot and edited the manuscript with CJB. All authors read and approved the final manuscript.